A customer brought in this lamp the other day and it had a broken socket. 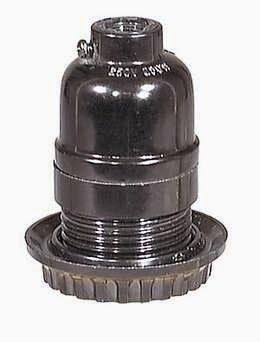 This socket was a keyless screw top plastic socket (sometimes called a phenolic or bakelite socket). These sockets are the most common in today's lamps because they are inexpensive and have a neutral color. All it takes is a short fall, a slight tip or a move to have the socket crack like this one. The only lamp part we need to fix this lamp is a replacement keyless bakelite socket with screw top collar. First the cord has to be removed. The lamp it laid on its side and a hole is cut in the bottom felt. The cord is removed from the socket interior. The socket cap twists off the lamp rod and the new socket cap is replaced. The socket cap is not moving and is probably glued to the threaded rod. The cord will need to be removed. Some of the cord is twisted and stiff. The cord will be reused, but cutting off the old UL knot will save time when removing and re-installing the cord. The old cord is pulled through the lamp body. The bottom nut is removed and the base comes off the lamp body. The rod is removed from the lamp body and placed in a vise. Heat is applied to the rod just below the socket cap. The heat releases the glue and the socket cap screws off the rod. The new socket cap has a set screw so no glue is used on the replacement. The rod is placed back in the lamp body and lamp base. A nut is attached to the rod and the lamp is tightened. The original cord is threaded through the lamp body. The wires are split, stripped and tipped. A UL knot is tied in the the cord and it is attached to the socket interior. The ribbed cord attaches to the silver screw and the smooth wire goes on the brass screw. The cord slack is pulled through the lamp and the socket shell is screwed on the socket cap.